The dignity of the proceedings of this solemn assembly causes me to have the comforting assurance that the Lord, in his goodness, continues to provide inspired leadership and divine guidance to his church, the purpose of which is to build his kingdom upon the earth and serve his children. His church extends the invitation to all who so desire to partake of the power of the gospel, which will lift an individual out of oblivion and, in so doing, will give a feeling of satisfaction and happiness not to be found elsewhere. It provides the sources of control for self-improvement, a stable character, and a truly successful life. Who is there who has reached that point in life where he can afford to allow himself to stop growing or to stop improving? Although I never had the privilege of meeting her, I am told that my wife’s mother often repeated the adage to her children: “If you consider yourself a nobody and do nothing to improve yourself to become a somebody, you truly will end up being a nobody.” She, no doubt, understood the power and capacity of every soul for self-improvement. The fourth Article of Faith reads: “We believe that the first principles and ordinances of the Gospel are: first, Faith in the Lord Jesus Christ; second, Repentance; third, Baptism by immersion for the remission of sins; fourth, Laying on of hands for the gift of the Holy Ghost.” [A of F 1:4.] As we briefly consider each of these principles, we will be aware of the power embodied in each of them. “Lord, have mercy on my son: for he is lunatick, and sore vexed: for ofttimes he falleth into the fire, and oft into the water. “And I brought him to thy disciples, and they could not cure him. “And Jesus rebuked the devil; and he departed out of him: and the child was cured from that very hour. The evidence of the power of faith is clearly defined by the Savior. Faith in God will cause the miracle of change and set the course of action on the true purpose of life. Repentance follows faith as naturally as the day follows dawn. The poet writes: “The morning breaks, the shadows flee.” (Hymns, no. 269.) Repentance is the very essence of change; it embodies the powerful principle of obedience to God’s law and discipline of self. When applied to our lives, it provides a cleansing joy which surges through us. The efficacy of the ordinance of baptism is unquestionable as it cleanses the reborn person. In these principles we find the unfailing power to change. As to the effective use of our leisure time, we have, in the gospel, unnumbered opportunities. 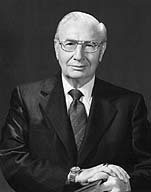 As one acquires knowledge of the gospel principles and pursues his course, he can successfully apply those principles to his individual circumstances, whether his position be one of great or meager possessions; whether it be early in life, during his economic production period, or in retirement. The gospel is meant to temper life and to bring it into true balance and fruition. The Lord has decreed that “the Church hath need of every member.” (See D&C 84:110.) This implies development of its members by participation in the programmed activities of children and youth, filling the numerous teaching opportunities, administration assignments, fulfillment of member duties, the fulfillment of priesthood duties, not forgetting to visit the homes of members (which, until this day, has not been attended to as the Lord directed), searching out the records of ancestors, and temple participation, all of which are only part of the never-ending list of activities with which to fill our leisure hours. As we consider the aspects of growth and achievement, the word success obviously comes to the fore﻿—success as it applies in terms of the world. Success or failure can carry most of us either to the peaks of happiness or to the depths of despair. People will do almost anything to keep from being branded a failure. If a man achieves worldly success and does not blend into his life a program of self-improvement to bring about a sensible balance, he no doubt will end up as a failure. He may win the honor of men, but what about his salvation﻿—his eternal future? Think back on the example of the man with the yacht. Was he successful? Worldly-wise, yes! But when it comes to the things that count, wasn’t he more like the man who “spent all his life letting down empty buckets into empty wells; and he is frittering away his age in trying to draw them up again”? (Sydney Smith in John Bartlett’s Familiar Quotations, p. 523.) Such people seek fulfillment and meaning in their lives but are unable to find it, because they themselves have misplaced their values. And I ask you, brethren, sisters, where would we be, where would you be, where would I be, if it were not for the power of the gospel of Christ? I bear witness to its power and I do so in the name of Jesus Christ. Amen.